The Hiblow HP-40 Linear Septic Air Pump is extremely quiet and energy efficient. The operating life of this unit is among the best available on the market. The Hiblow HP-40 is used on some 500 GPD Aerobic Treatment Systems and in small pond and water garden aeration applications. The Hiblow HP 40 is a compatible replacement for the Gast SPP-40, Thomas 5040A, Medo LA-45B, Secoh SLL-40, and many other 40 LPM units. The Hiblow HP-40 is used on some 500 GPD rated NSF Class 1 Standard 40 aerobic treatment systems (ATUs). The Hiblow linear diaphragm septic air pumps are widely regarded as the highest quality and longest lasting septic air pumps available on the market. They are extremely quiet and very energy efficient. The Hiblow HP-40 can be used for septic tank aeration as well as an aerator for small ponds and water gardens. THE LIFELINE TO YOUR AEROBIC SEPTIC SYSTEM! The septic air pump is literally the lifeline of your aerobic system. The system cannot function the way it was designed without the air pump working. The actual purpose of the air pump is two-fold. First, the air pump puts oxygen into the water allowing the formation and survival of Aerobic bacteria. These Aerobic bacteria are what eat up all of the waste in the tank. They are much larger and more efficient at processing waste as compared to the anaerobic bacteria found in a conventional septic system. Secondly, the air pump creates an action in the tank that breaks down large solids into tiny particles, making it very easy for the bacteria to attach to and devour the waste. If you air pump quits working on your aerobic system, over a period of about 2 weeks the system will begin to turn back anaerobic. The biggest problem with this happening is that there is no secondary treatment system behind your aerobic system, as you have in a conventional anaerobic septic system. Once the aerobic system turns back anaerobic, instead of producing a clear odorless discharge the effluent will be closer to raw sewage. As you may realize, raw sewage discharging into a ditch, lake, or pond, or being sprayed on your lawn is not a good thing. This is why it is important to your system for the air pump to be up and running. SEPTIC AIR PUMP SIZE DOES MATTER! The other misconception is that the air pump just puts air in the water, so it doesn’t really matter which size is used. Nothing could be further from the truth. Air pump sizing is actually very important to the operation of your system, and not every system will use the same size air pump. If you have been our website, then you already know there are many different types and sizes. The air pump size is normally determined by the volume capacity of the tank, the style of air diffusers in the tank, and how many GPD (Gallons Per Day) the system is designed to treat. 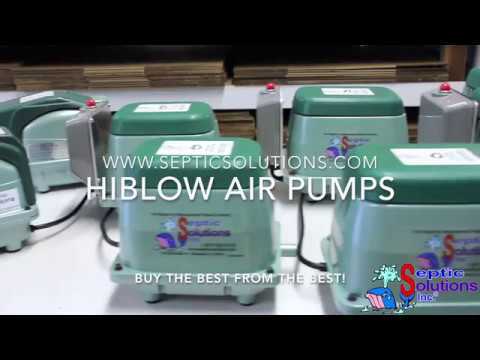 Below are some frequently asked questions about the Hiblow HP-40 Septic Air Pump. If you have further questions, call our customer support staff toll free at 1-877-925-5132 or email sales@septicsolutions.com! Can the Hiblow HP-40 be left out in the weather or does it need a weatherproof cover? The Hiblow HP-40 is considered weatherproof and can be installed without a cover. However we highly recommend using an air pump housing to further protect the unit from the elements. Click here to view the air pump housing options. Does the Hiblow HP-40 come with the fitting to connect to my alarm or control box? Yes. The Hiblow HP-40 comes with an optional brass barb fitting that will allow you to connect a 1/8'' airline from the air pump to your alarm or control box. Does the Hiblow HP-40 come with a manufacturer's warranty? Yes. The Hiblow HP-40 comes with a standard manufacturer's warranty of 1 year, as well as an additonal year of coverage by Septic Solutions because this item is included in our Whale of a Deal program. Every Hiblow HP-40 purchased from Septic Solutions is covered under warranty for 2 years from the date of purchase. What size airline should I use with the Hiblow HP-40? The Hiblow HP-40 air pump is designed to be used with 1/2'' ID airline or larger. It comes with a rubber 90 coupling connector and hose clamps. I have a Hiblow HP-40-0110. Will Septic Solutions' Hiblow HP-40 be compatible? Our Hiblow HP-40 actually comes with the model number HP-40-0115. That is our unique distributor number. The Hiblow HP-40-0110 is the stock Hiblow model and our unit is completley compatible with any HP-40-xxxx. We offer the Hiblow HP-40 in refurbished as well as new. Most of our refurbished units have been in operation for 5-7 years. They come into our shop and our technicians replace the diaphragms and any other components neccessary to make the air pump operational again. If you prefer to install rebuild kits into your air pump yourself, the new Hiblow HP-40 is the route to go. If you prefer to purchase a new pump every 5-7 years when the diaphragms fail, then the refurbished is your best option. Overall the refurbished units are going to be considered "throw away" units when they fail, whereas the new units will be repairable when they fail with parts you can purchase from Septic Solutions.